Adrenal cortical adenoma is a common benign tumor arising from the cortex of the adrenal gland. It commonly occurs in adults, but it can be found in persons of any age. The prevalence of adrenal adenoma increases with age; the frequency of unsuspected adenoma is 0.14% in patients aged 20–29 years and 7% in those older than 70 years. Adrenal cortical adenomas are not considered to have the potential for malignant transformation. Homogeneously enhancing ovoid mass is seen in the left adrenal gland. Contrast-enhanced CT scan demonstrates a homogeneously enhancing ovoid mass in the left adrenal gland. 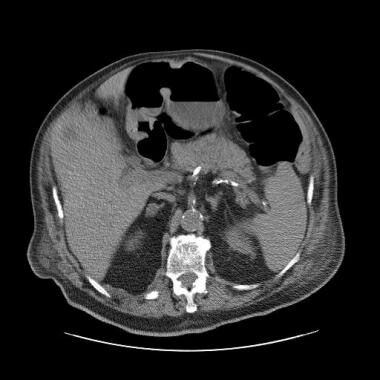 As in this case, attenuation measurements of adrenal masses on contrast-enhanced CT scans are frequently nondiagnostic. Adrenal cortical adenoma can be diagnosed with a high degree of accuracy: the specificity of imaging studies ranges from 95-99%, and the sensitivity is greater than 90%. 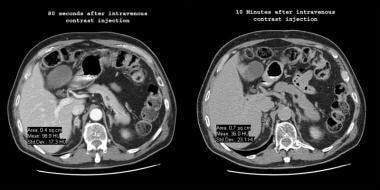 These impressive percentages are a result of the relatively high prevalence of adrenal adenomas in the general population and the extensive radiologic research with imaging methods, primarily CT and MRI. The adrenal gland is the fourth most common site of metastasis, and adrenal metastases may be found in as many as 25% of patients with known primary lesions. 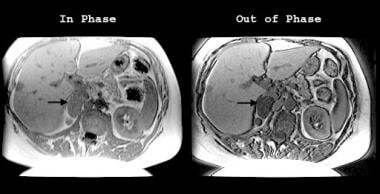 Therefore, radiologists frequently face the task of determining whether an adrenal mass is benign or malignant. The question can directly affect the clinical management of the case. For instance, the workup for an otherwise resectable lung cancer may reveal the presence of an adrenal mass and suggest the possibility of metastatic disease. 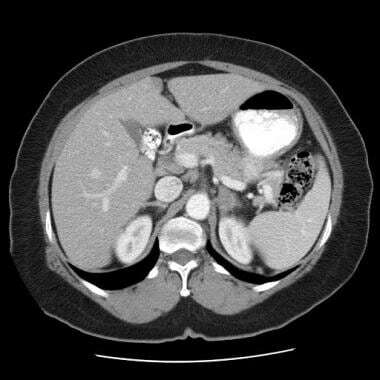 The modalities of choice in the evaluation of an adrenal mass are computed tomography (CT) scanning, magnetic resonance imaging (MRI), and positron emission tomography (PET) scanning. [2, 3] Note that on CT scans and MRIs, the appearance of intracytoplasmic lipid is different from that of macroscopic fat, as in the case of a myelolipoma. Plain radiography and ultrasonography are less sensitive and have been used less frequently since the advent of CT scanning and MRI. Ultrasonography has a role in the evaluation of a potential adrenal incidentaloma (AI) in infants, but no appearance is specific for benign adrenal adenoma. First, does the patient have a hormonal or biochemical abnormality that may be caused by an enlarged adrenal gland? If this is the case, the lesion should be surgically removed regardless of the imaging features. Second, does the patient have a known malignancy? In the absence of a known malignancy, the probability that a small, well-circumscribed adrenal mass is malignant is nearly zero. The characterization of an adrenal mass is critical in patients with a known malignancy, in whom the diagnosis of an adrenal metastasis precludes curative surgery. A delay in CT imaging can potentially diminish the efficiency of the CT schedule, result in multiple examinations, and expose the patient to ionizing radiation. MRI examination may enable diagnosis without exposing the patient to ionizing radiation; however, MRI may not be as available as CT and can be more expensive. Homogeneous, well-defined, 7-HU ovoid mass is seen in the right adrenal gland; this finding is diagnostic of a benign adrenal adenoma. Dynamic and delayed contrast-enhanced CT scans demonstrate a homogeneously enhancing mass in the right adrenal gland. The degree to which enhancement diminishes over time is referred to as washout, which can be calculated by using the following formula: [1 - (attenuation at 10 minutes/attenuation at 80 seconds)] X 100, where the attenuations are in Hounsfield units. In this case, the washout equals [1 – (36/99)] X 100, or 64%. Findings from a recent publication in a major journal suggests that any washout greater than 50% is diagnostic of a benign adrenal adenoma. Further studies are needed to confirm these promising results. Findings from multiple studies confirm that an attenuation of 10 HU or less is diagnostic of adrenal cortical adenoma, with 79% sensitivity and 96% specificity. With a threshold of 0 HU, the diagnosis may be made with 47% sensitivity and 100% specificity. The decision about how to measure attenuation should be made carefully. The selected region of interest should be as large as possible without including adjacent tissues, particularly periadrenal fat. Adenoma-mimicking false-positive lesions that measure 10 HU or less on unenhanced CT have been reported. These lesions include adrenal hyperplasia, adenoma with coexisting non-adenoma, and pheochromocytoma. The initial enhancement patterns of adrenal cortical adenomas and adrenal metastases overlap substantially; therefore, simple attenuation measurements are not useful in distinguishing between the two. A delayed attenuation measurement (obtained 10 minutes after the injection) of 30 HU or less is diagnostic of benign adenoma, but only a small percentage of adrenal adenomas have this finding. Intravenous contrast agent is administered, and a scan is obtained after an 80-second delay. A subsequent scan is obtained after a 10-minute delay. A region of interest is drawn over the adrenal mass, and the attenuation is measured in Hounsfield units at 80 seconds and at 10 minutes. The percentage of contrast agent washout is equal to [1 – (attenuation at 10 minutes/attenuation at 80 seconds)] X 100, where the attenuations are in Hounsfield units. Washout is a measurement of the percentage decrease between the initial enhancement and the delayed enhancement. A large decrease is a high-percentage washout, and a small decrease is a low-percentage washout. If delayed enhancement is exactly half of the initial enhancement, the washout is exactly 50%. In a series of 101 adrenal masses,  a washout of greater than 50% was specific for benign adrenal adenoma, and a washout of less than 50% was specific for metastasis. Interestingly, these findings are not correlated with the percentage of intracytoplasmic lipid, and the physiologic mechanism resulting in this distinction is not well understood. With a threshold of 50%, use of the washout value yields 98% sensitivity and 100% specificity. In this series, the 2 missed lesions were benign adenomas that had washouts of 0% and 40%. Both lesions had values of less than 30 HU on delayed images and were correctly diagnosed as benign adrenal cortical adenomas without use of the washout criteria. If the 2 lesions are excluded from the series, the accuracy for this method is 100%. It is important to remember that benign lesions such as adrenal hematomas or pseudocysts do not enhance with the intravenous administration of contrast material; therefore, these lesions do not have a washout value. T1-weighted and T2-weighted signal intensity characteristics of benign adrenal adenomas and adrenal metastases are not specific and overlap significantly. However, in-phase and out-of-phase imaging (eg, chemical shift imaging) can be used to diagnose adrenal cortical adenomas with 81-100% sensitivity and 94-100% specificity. Out-of-phase chemical shift images of lipid-rich adrenal adenomas show a decrease in signal intensity. The signal intensity from the spleen can be used as a reference, and ensuring identical preimaging values with both sequences is important. A decrease of 20% in the signal intensity on out-of-phase images relative to that on in-phase images is diagnostic. The signal intensity from liver should not be used as a reference because it may contain lipid. MRIs obtained with in-phase (left) and out-of-phase (right) imaging after CT imaging. Note how the signal intensity in the left adrenal mass (white arrow) decreases (ie, the mass is darker) relative to that of the spleen on the out-of-phase images. As in this case, a signal intensity decrease of 20% or greater is diagnostic of a benign adrenal adenoma. An adrenal adenoma (arrows) is diagnosed with follow-up MRI when decreased signal intensity is seen on the out-of-phase image. MRI images demonstrate a homogeneous ovoid mass in the right adrenal gland (arrows). A concomitant loss of signal intensity, relative to that of the spleen, with out-of-phase imaging is diagnostic of benign adrenal adenoma. Results of 2 series showed that the percentage decrease in signal intensity on chemical shift images is directly proportional to the amount of intracytoplasmic lipid. Therefore, MRI findings are unlikely to be diagnostic if an adrenal mass has values greater than 30 HU on nonenhanced CT scans. The visual inspection of signal intensity loss on out-of-phase images is as effective as signal intensity measurements. One important technical point is that the echo time used for out-of-phase imaging should be shorter than that used for in-phase imaging, so that signal intensity loss reflects the presence of lipid and not T2 decay. MRI cannot be used to definitively characterize lipid-poor adenomas. Although Krestin et al previously described washout with MRI,  the calculations are much more cumbersome to perform than with CT washout in the diagnosis of a lipid-poor adenoma. Because this test does not depend on the presence of lipid, it can potentially be used to characterize both lipid-rich and lipid-poor adenomas. The use of whole-body PET, especially in staging lung cancer, may decrease the number of adrenal biopsies performed to assess indeterminate lesions. Park JJ, Park BK, Kim CK. Adrenal imaging for adenoma characterization: imaging features, diagnostic accuracies and differential diagnoses. Br J Radiol. 2016 Jun. 89 (1062):20151018. [Medline]. [Full Text]. Patel J, Davenport MS, Cohan RH, Caoili EM. 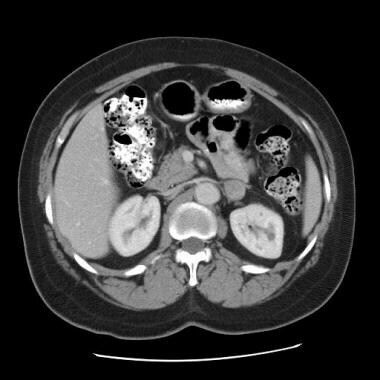 Can Established CT Attenuation and Washout Criteria for Adrenal Adenoma Accurately Exclude Pheochromocytoma?. AJR Am J Roentgenol. 2013 Jul. 201(1):122-7. [Medline]. Korivi BR, Elsayes KM. Cross-sectional imaging work-up of adrenal masses. World J Radiol. 2013 Mar 28. 5(3):88-97. [Medline]. [Full Text]. Wale DJ, Wong KK, Viglianti BL, Rubello D, Gross MD. Contemporary imaging of incidentally discovered adrenal masses. Biomed Pharmacother. 2017 Mar. 87:256-262. [Medline]. Boland GW, Lee MJ, Gazelle GS, Halpern EF, McNicholas MM, Mueller PR. Characterization of adrenal masses using unenhanced CT: an analysis of the CT literature. AJR Am J Roentgenol. 1998 Jul. 171 (1):201-4. [Medline]. Kim SJ, Lee SW, Pak K, Kim IJ, Kim K. Diagnostic accuracy of 18F-FDG PET or PET/CT for the characterization of adrenal masses: a systematic review and meta-analysis. Br J Radiol. 2018 Jun. 91 (1086):20170520. [Medline]. Park SY, Park BK, Park JJ, Kim CK. CT sensitivity for adrenal adenoma according to lesion size. Abdom Imaging. 2015 Oct. 40 (8):3152-60. [Medline]. Doppman JL, Gill JR Jr. Hyperaldosteronism: sampling the adrenal veins. Radiology. 1996 Feb. 198(2):309-12. [Medline]. Seo JM, Park BK, Park SY, Kim CK. Characterization of lipid-poor adrenal adenoma: chemical-shift MRI and washout CT. AJR Am J Roentgenol. 2014 May. 202 (5):1043-50. [Medline]. Shi JW, Dai HZ, Shen L, Xu DF. 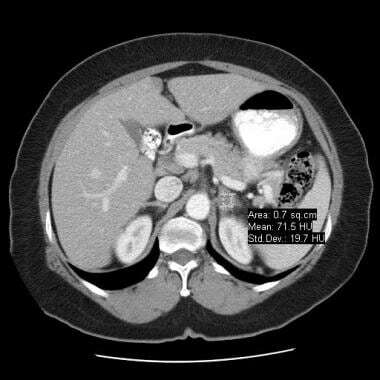 Dual-energy CT: clinical application in differentiating an adrenal adenoma from a metastasis. Acta Radiol. 2014 May. 55 (4):505-12. [Medline]. Yasaka K, Gonoi W, Akai H, Katsura M, Akahane M, Kiryu S, et al. Differentiation of adrenal tumors in patients with hepatocellular carcinoma: adrenal adenoma versus metastasis. Eur J Radiol. 2013 Aug. 82 (8):1213-8. [Medline]. Bovio S, Cataldi A, Reimondo G, Sperone P, Novello S, Berruti A, et al. Prevalence of adrenal incidentaloma in a contemporary computerized tomography series. J Endocrinol Invest. 2006 Apr. 29(4):298-302. [Medline]. Park SY, Park BK, Park JJ, Kim CK. Differentiation of Adrenal Hyperplasia From Adenoma by Use of CT Densitometry and Percentage Washout. AJR Am J Roentgenol. 2016 Jan. 206 (1):106-12. [Medline]. [Full Text]. Pena CS, Boland GW, Hahn PF, et al. Characterization of indeterminate (lipid-poor) adrenal masses: use of washout characteristics at contrast-enhanced CT. Radiology. 2000 Dec. 217(3):798-802. [Medline]. Ho LM, Paulson EK, Brady MJ, Wong TZ, Schindera ST. Lipid-poor adenomas on unenhanced CT: does histogram analysis increase sensitivity compared with a mean attenuation threshold?. AJR Am J Roentgenol. 2008 Jul. 191(1):234-8. [Medline]. Halefoglu AM, Bas N, Yasar A, Basak M. Differentiation of adrenal adenomas from nonadenomas using CT histogram analysis method: A prospective study. Eur J Radiol. 2009 Jan 21. [Medline]. Hood MN, Ho VB, Smirniotopoulos JG, Szumowski J. Chemical shift: the artifact and clinical tool revisited. Radiographics. 1999 Mar-Apr. 19(2):357-71. [Medline]. Krestin GP, Steinbrich W, Friedmann G. Adrenal masses: evaluation with fast gradient-echo MR imaging and Gd-DTPA-enhanced dynamic studies. Radiology. 1989 Jun. 171(3):675-80. [Medline]. Khati NJ, Javitt MC, Schwartz AM. Adrenal adenoma and hematoma mimicking a collision tumor at MR imaging. Radiographics. 1999 Jan-Feb. 19(1):235-9. [Medline]. Siegal MJ. Pediatric Sonography. 2nd ed. Lippincott-Raven. 1995. Mittelstaedt CA. Abdominal Ultrasound. 5th ed. 1989. Treglia G, Oragano L, Fadda G, De Gaetano AM, Raffaelli M, Rufini V. Markedly Increased 18F-FDG Uptake in a Nonfunctioning Adrenal Adenoma Mimicking Malignancy. Clin Nucl Med. 2013 Mar 11. [Medline]. Boland GW, Dwamena BA, Jagtiani Sangwaiya M, Goehler AG, Blake MA, Hahn PF, et al. Characterization of Adrenal Masses by Using FDG PET: A Systematic Review and Meta-Analysis of Diagnostic Test Performance. Radiology. 2011 Apr. 259(1):117-26. [Medline]. Homogeneous, well-defined, 7-HU, ovoid mass is seen in the right adrenal gland; this finding is diagnostic of a benign adrenal adenoma.